Amit Chourasia leads the Visualization group at the San Diego Supercomputer Center (SDSC). 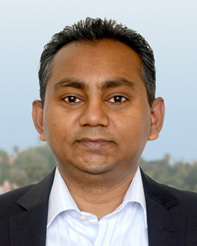 His work is focused on research, development and application of software tools and techniques for visualization. Key portion of his work is to find ways to represent data in a visual form that is clear, succinct and accurate - a challenging yet very exciting endeavor.